Sean Wheeler & Zander Schloss – When Sean Wheeler and his desert psycho-billy punk band Throw Rag opened up for the Circle Jerks in 2004, it began a musical friendship between frontman Sean Wheeler and and multi-instrumentalist Zander Schloss that is still thriving today. When the two rabble-rousers paired up as an acoustic duo, they surprised fans and strayed from their punk rock roots. 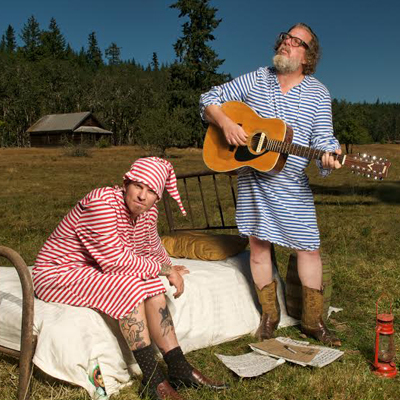 The duo expounds on folk, country, ragtime, bluegrass and gospel calling on Zander’s transcendent acoustic guitar work and Sean’s commanding presence, tempestuous vocals and campy lyrics to interpret the roots of American music with a spirited punk appeal.